I'm quoted in this report. 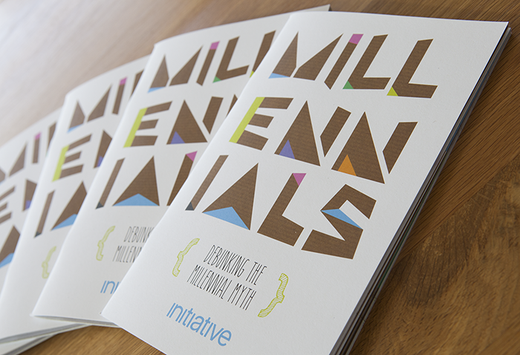 If you're interested in marketing to Millennials, you can download it by clicking the image. The report was published by Initiative, a hip agency based in London, England, that is part of IPG. Here's the full text of my interview with Hanna. Do you agree with me? What do you think is the secret of TJ's success with younger consumers? Mediabrands: What is at the root of Trader Joe’s success? Mark Gardiner: They’d tell you, “We’re a product-driven company,” and that’s part of the story. But TJ’s incredibly strong brand—and the company’s sustained growth and financial success in a very difficult category—is rooted in millions of face-to-face interactions between shoppers and front-line retail staff. TJ’s ‘crew members’ are famously chatty and cheerful (sometimes annoyingly so!) The brand relies on the oldest trick in a merchant’s book: Friendly, personal service. Mediabrands: Is their secrecy part of their success? Mark Gardiner: Yes and no. The company’s cutthroat management style is not consistent with the friendly, laid-back vibe in the stores. For example, TJ’s didn’t stop selling red-listed fish until Greenpeace lampooned it with a Traitor Joe’s website. So they have to be secretive, in order to prevent a sort of cognitive dissonance amongst shoppers. But it’s to the point now that the company’s secretive ways are becoming the story. The counter-example here would be Patagonia. Their front line retail staff can be a little snotty, but the company’s management is remarkably transparent, and the company lives its brand values, all the way up the org chart, and throughout its procurement and manufacturing. 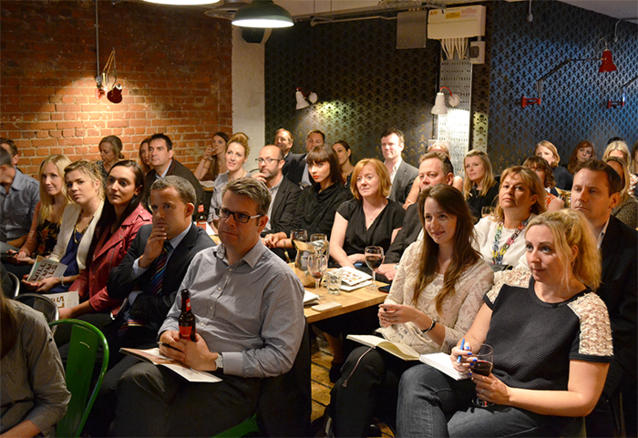 A collection of marketing and agency types gathered in Farringdon, in central London, to listen to Hanna and a few of her co-workers present their insights into Millennial consumers. Mediabrands: Why is it particularly successful with Millennials? Mark Gardiner: It’s worth noting that there are things you might expect TJ’s to do well, that they don’t do at all. For a hip California company with a devoted following of young consumers, they have almost no social media presence. The company has a relatively rudimentary web site, a moribund Twitter feed, and no official Facebook page. At the product level however, TJ’s ‘gets’ Millennials. People under 35 today were the first demographic group raised entirely in the era of Hot Pockets, Lunchables, and the Starbucks drive-through. In the U.S., they attended schools in which Home Economics classes had been cut back. Sure, they watch cooking shows on TV, but they’re not big on practical kitchen skills. Perhaps that’s why snacks and prepared meals (particularly frozen meals) contribute most of the profit from TJ’s food sales. Relatively sharp prices and a good assortment of cheap, drinkable wine are also strong selling points for the under 35 crowd; in the U.S. they’re all still paying off their student loans! One New York Times journalist called TJ’s “the home of lonely food”, which is an evocative way of describing the single customer who has worked late, and stopped by TJ’s on the way home to pick up a frozen mac ‘n cheese or pre-made salad and a bottle of Two Buck Chuck, that they’ll eat alone, while updating their Match.com profile. In that context the warm, friendly TJ’s shopping experience is a welcome relief. The company may not get social media, but it understands the value of that real-world social experience. Mediabrands: What is at the essence of the brand? Mark Gardiner: A fun, friendly shopping experience, that makes the things you buy there seem even better. The key to this is, hiring the right people. As I explain in my book, “Build a Brand Like Trader Joe’s”, you can train skill, but you have to hire attitude. TJ’s offers good wages and benefits, and the store seems like a fun place to work. (Imagine, as a 30-something, telling your peers, “I work at McDonald’s.” They’d think, “loser”. Tell them you work at Trader Joe’s and the response is, “Fun! I love that place.” As a result, TJ’s has its choice of employees. And it uses that choice to hire natural extroverts. Millennials are skeptical about a lot of the things companies do to promote their brands, but the authentic contact they make with TJ’s employees (who skew, age-wise, into the same category) isn’t perceived as “marketing” or “corporate”. It comes across as authentic, because it almost always is authentic. Crew Members create authentic connections with customers—not because they are told to do so, or trained to do so (although they are told, and trained) but rather because that’s who they are. Mediabrands: What does it understand that other brands in its category don’t? Mark Gardiner: A.) TJ’s doesn’t try to please everyone. Fun exercise: Google “Why I hate Trader Joe’s” and “Why I love Trader Joe’s”. You’ll see the same traits listed in both places. But TJ’s knows that if half of America’s grocery shoppers love its brand, that’s more than enough to be profitable; who cares if the other half hates them? Wishy-washy companies that try not to offend anyone don’t give anyone a reason to love them, either. B.) TJ’s understands that paying front line customer service staff a little bit more is a great investment. MIT prof Zeynep Ton’s research has amply proven that the retail chains that pay staff the highest wages have higher rates-of-sale and are more profitable. Retailers who increase customer service pay show increased profits, and retailers who cut staff costs typically lose profit as a result. Trader Joe’s pays better than average retail salaries, and offers better than average benefits, so it can easily recruit employees who will naturally extend that cheerful, sociable brand. The company’s built one of America’s most valuable brands virtually without advertising. That savings alone would easily cover the cost of paying customer service staff another $2-$3 per hour. Mediabrands: What is the future for Trader Joe’s – what risks do you foresee? Mark Gardiner: TJ’s has lots of growth potential in the U.S.; it could easily double sales volumes by expanding into markets where it is not active at all, and many markets that have 2-3 Trader Joe’s stores could support twice that many. The company’s been successful because it’s always focused on the relationship between customers and the store, and saved the hard bargaining for its relationship with suppliers. The biggest risk is that the company’s current CEO is an accountant, not a merchant. I think TJ’s is beginning to see it’s crew members as a cost center and not as a key source of the company’s profits. Mediabrands: What can other brands learn from Trader Joe’s? Mark Gardiner: Hire the right people, then have the courage of your convictions and really empower them to live and promote your brand values. The authentic connections they make with consumers are priceless—especially so when the consumers are Millennials who’ve long been jaded when it comes to ‘messages’ from brands. If you’re a highly-paid VP Marketing, that’s scary advice. I’m telling you to place your brand—perhaps your company’s most valuable asset—in the hands of your lowest-paid employees. But think of it this way: Those front line employees have always been empowered to reduce the value of your brand. No matter how great your new product or ad campaign, if the customer comes to the store and is treated poorly, they’ll hate your company. Since your customer service staff can already reduce your brand equity, you have nothing to lose by empowering them to increase it. 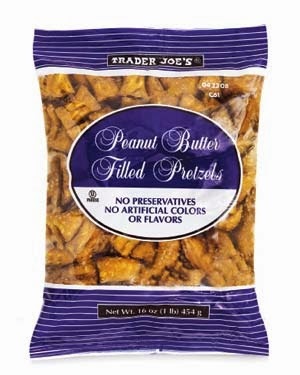 One of the most popular items in Trader Joe's salty snack aisle are these peanut butter-filled pretzels. We used to sell case after case of these on days leading up to big football games, and I can only imagine how many are currently being stocked up in anticipation of the Super Bowl. But they've left the owners and employees at a Maxim Marketing Corp., a California-based snack company, with a bad taste. According to a lawsuit between Maxim and Con-Agra, a giant food conglomerate based in Omaha, Con-Agra has stolen Maxim's Trader Joe's business. Maxim's story is that, for years, Con-Agra supplied the pretzel "pockets" that Maxim filled with peanut butter and then sold to Trader Joe's. I'm not sure if Maxim claims to have actually invented the filled pretzel, but they do sell a similar product that they call, "The Original Pocket Pretzels®". Now, it seems that Con-Agra has gone around Maxim, and is filling its own pockets. Luckily, Maxim has other customers. Trader Joe's buyers love being a small company's only customer, though that has obvious risks because TJ's projects a "South Seas" vibe but the company acts more like a cutthroat pirate when negotiating supply deals. Anyway, Maxim will miss the $10M in revenue from selling (my guess) about 7M bags of pretzels to Trader Joe's per year, but it will survive this setback. Whether it succeeds in its suit against Con-Agra will hinge on two things: did their contract include a non-compete clause, and; can a much smaller company possibly win a fight with a giant?